Horsetail Herbs was established several years ago with a range of natural products for horses including creams, ointments, salves, hoof oils, shampoos and conditioners. From there it has developed to provide a comprehensive service that supplies a wide range of quality herbs. These are available in small and large quantities, individually formulated herbal medications, and a range of supplements that are proving to be highly successful for a number of common conditions, meeting the increasing needs of the equine community. We have an online consultation service with certified Equine Naturopath, Les Rees who is also available for talks and will be giving short courses on the use of herbal medicine in the near future. Our philosophy is to promote herbal medicine as a means of natural healing. If our horses were allowed to roam in the wild, they would be able to select the herbs needed to self medicate. 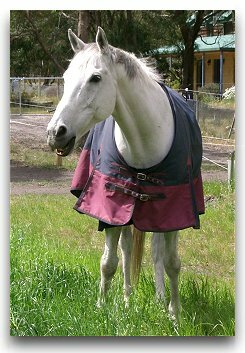 The domesticated horse no longer has that option available, which suggests that there is a need to understand how to replace the gentle healing properties of natural medicines. If you would like to contact us, please email info@horsetailherbs.com.au.